"For successfully applying his engineering and leadership talents in developing a significant mining company, creating an outstanding engineering college, and enriching his community's cultural life." Henry T. Mudd is Chairman of the Board and Chief Executive Officer of Cyprus Mines Corporation. He received his BA degree from Stanford University in 1935 and his MS in mining engineering from the Massachusetts Institute of Technology in 1938. Following government service during World War II, he joined Cyprus Mines Corporation in 1946 as Assistant General Manager. He assumed his present position in 1955. Mr. Mudd represents the third generation of his family involved in the field of mining. His grandfather, Col. Seeley W. Mudd, was primarily responsible for the rediscovery and reopening of ancient copper mines on the Island of Cyprus which formed the sole basis of the business of Cyprus Mines Corporation until after World War II. Col. Mudd's son, Harvey S. Mudd, succeeded Col. Mudd as head of Cyprus Mines Corporation in 1926. He was President of AIME in 1945. 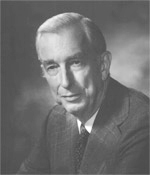 Since the death of his father in 1955, Henry T. Mudd has guided the diversification of Cyprus Mines Corporation. Recent accomplishments of the company include a seven-fold expansion of the company's Bagdad, Arizona, copper mining operation, a major uranium discovery in Colorado, and the development of a new hydrometallurgical process for the production of high-purity copper from copper concentrates. Since 1963 Mr. Mudd has been Chairman of the AIME Seeley W. Mudd Memorial Fund Committee. He is a director of a number of major corporations, and civic, educational, and cultural organizations. He was the driving force behind the creation of the highly regarded engineering college named for his father, and is Chairman of the Board of Trustees of that institution, Harvey Mudd College.